Pochette (poe – shėt, from the French for “little pocket”) has long, lean lines with gentle set-in waist shaping that accentuates, yet skims gently, over a woman’s curves. 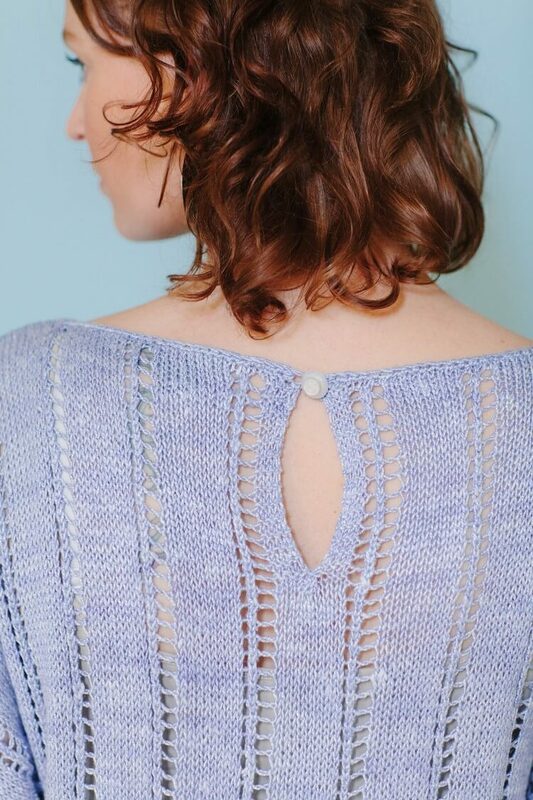 Its airy sheerness looks beautiful worn over a camisole, but maintains its cool breathability when knitted up on US Size 5 or 6 needles. 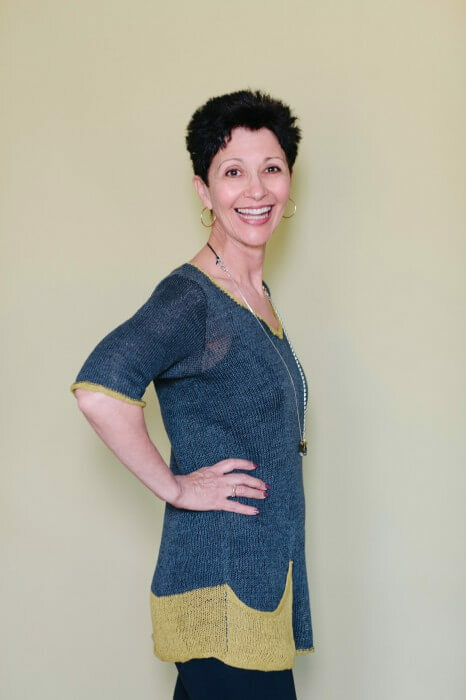 With elbow-length sleeves, a flattering V-neck and color-blocking to add visual interest, this tunic goes from the office to a night out with ease. Although it’s elegant enough to wear with a long, minimalist necklace as shown here, Pochette would also be spectacular with a patterned silk scarf draped around the neck. 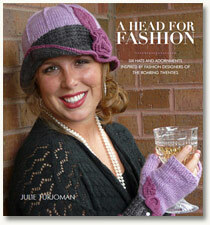 Curved pockets grow out of the color blocking, and are achieved with Short-Row shaping. To my eye, the colors “Apple” and “Tar” sang in perfect harmony when combined. 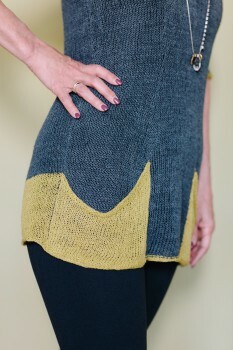 I love this serious shade of gray next to the chartreuse; each color becomes its best self when edged with the other. 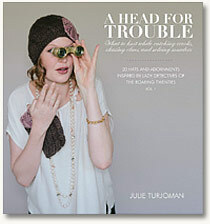 The lovely linen yarn used in this project is Shibui Linen. Softer than your average linen, it nonetheless has the lovely dry, crisp hand that we associate with linen fiber. 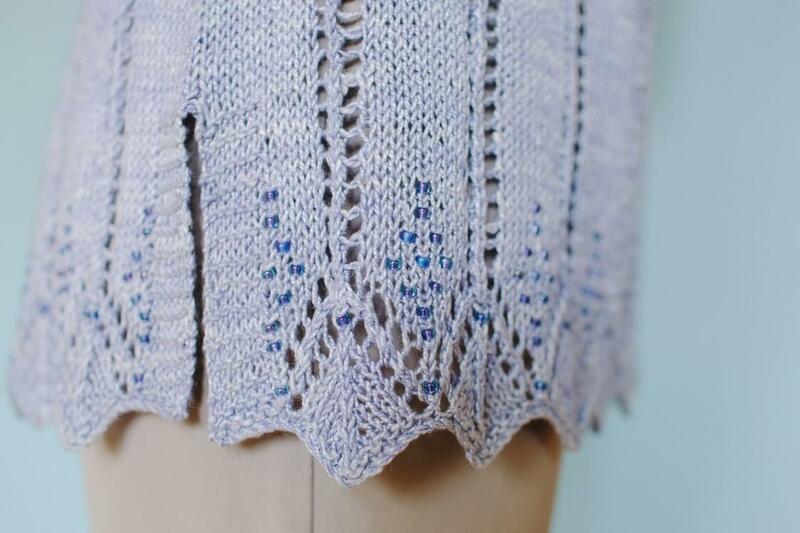 Airy and light, this is a quintessential summer yarn, with a unique chain ply structure that is an absolute dream to work with. Never splitty or rough on the hands, it slides through the fingers and has just enough texture to stay put on the needles. While the tunic is a natural over leggings or jeans, it would dress up beautifully worn belted over a long, floaty skirt. I designed Haven with multiple purposes in mind. There’s nothing like a “versatility challenge” to get me thinking, swatching, sketching, and swatching some more. One of the great things about living in Chicago is that in the summertime, several lakefront beaches are a mere 15-minute walk from my apartment. With a book and a cold drink in hand and my toes in the cool lake, I can’t think of a better way to laze away a weekend afternoon than on a sandy beach. But it would feel a bit odd to me to stroll around downtown among the business professionals and the tourists without some kind of cover over my bathing suit. And if I can also wear that cover as a casual top, or an oversized, comfortable layer over a camisole, so much the better. Haven began with a fetching zig-zag lace pattern in one of my Japanese stitch dictionaries. 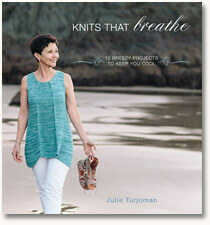 I was so taken with it that I swatched it ages ago, well before beginning the designs for Knits That Breathe. Ever since then, it has been pinned to my inspiration board where I could look at it every day until the right project came along. 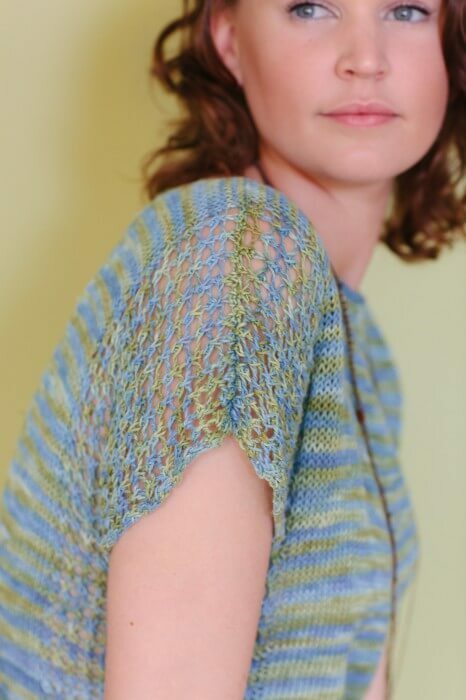 Once I had sketched out a plan for Haven with an asymmetrical lace motif, sloping shoulders, and breezily open sides, the lace swatch started shouting (metaphorically, of course) “Pick me! Pick me!” It would have been cruel to refuse. Not to mention, it’s perfect. 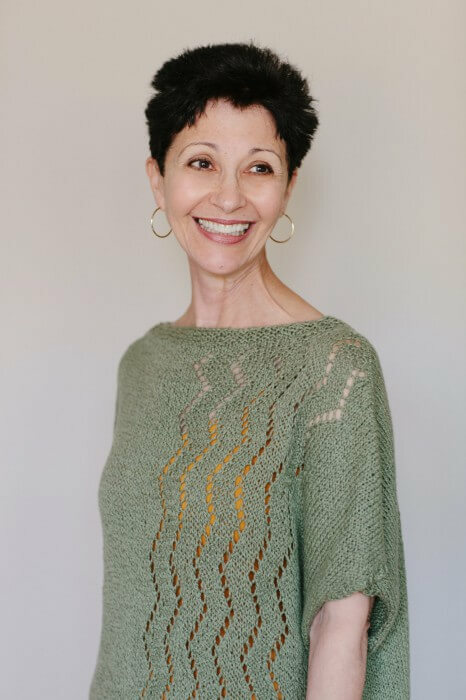 Berroco’s Linsey yarn, a 64% cotton and 36% linen blend that is soft to the touch yet offers wonderful stitch definition is also, as Berroco describes it, “colored in the sun-weathered shades of summertime.” That subtly tweedy color variegation is part of its appeal. An additional feature is how marvelously cool it feels against the skin. Cotton and linen are two stalwarts in terms of moisture wicking and absorbency. 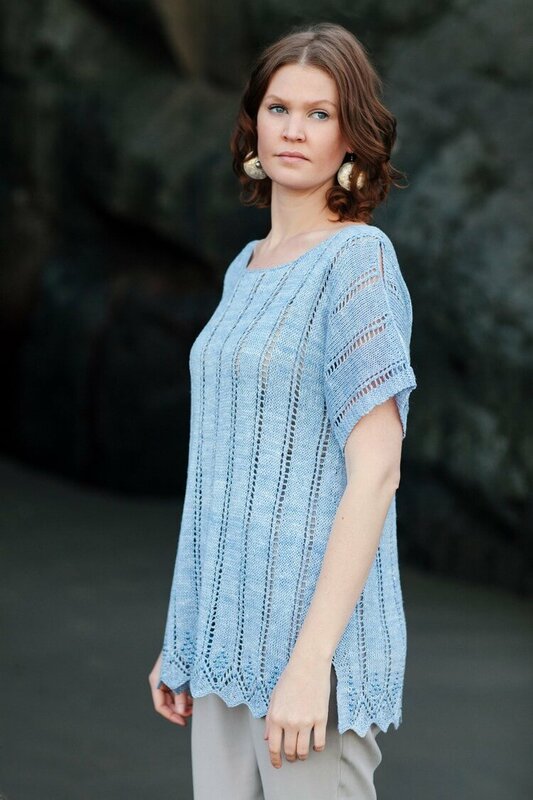 The linen content gives Linsey’s knitted fabric a judicious hint of the crispness we associate with that fiber, making it truly perfect for a hot day. 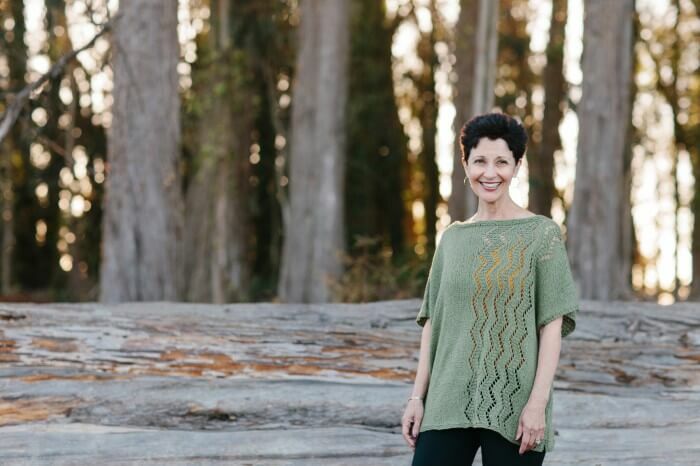 For comfort, drape, and quintessential summer style, the Still Waters Tee is easy on the eyes and easy to love. Worked in crisp linen that softens with washing and wear, its strategically placed mesh lace side panels and sleeves give new relevance to the concept of air conditioned clothing. 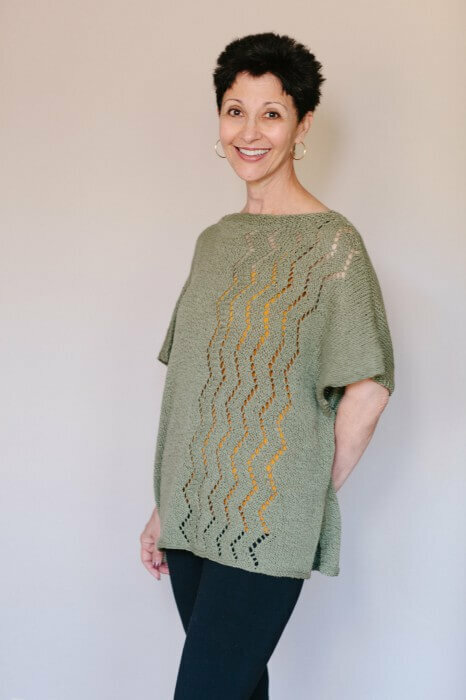 Knit in the round up to the armholes and then divided for the sleeves, front, and back, Still Waters offers easy construction and visually simple but highly effective texture. Two short seams at the top of the shoulders means that only minimal finishing is required before the tee is ready to wear. And with summer calling, what could be better than that? 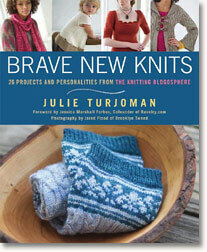 I can’t say enough good things about Claudia Hand Painted Yarns “Drama” – 100% Linen yarn. 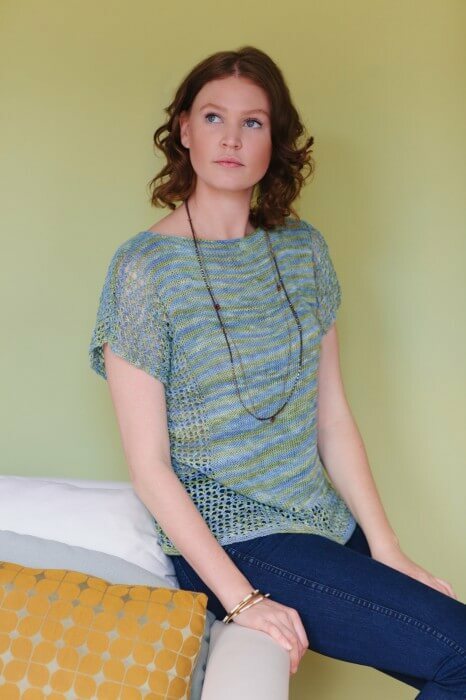 Gorgeous colors (I used Blue Fields for this project), lovely drape tempered by linen’s natural dry texture, and unparalleled stitch definition. As the linen softens with wear, I love this tee even more, and find myself reaching for it often to pair with everything from jeans to a linen skirt. I suspect you will, too!